You often read about options making it easier for traders to act on a wider range of opinions—bullish, bearish, or neutral. This can be true, but like everything else in the markets, ultimately you have to buy ‘em low(er) and sell ‘em high(er), even if you do the selling part first. And options traders know one thing that results in higher options prices is higher implied volatility (IV), which is the part of an option’s premium that represents the market’s estimate of future volatility: All else being equal, the more volatile traders expect the underlying stock (or futures contract) to be, the costlier its options will be—which may be bad news for potential options buyers, but good news for options sellers. The October low around $79, which was the lowest low of the September–October trading range, marked the bottom of DLTR’s roughly 32% decline from its January 2018 high. 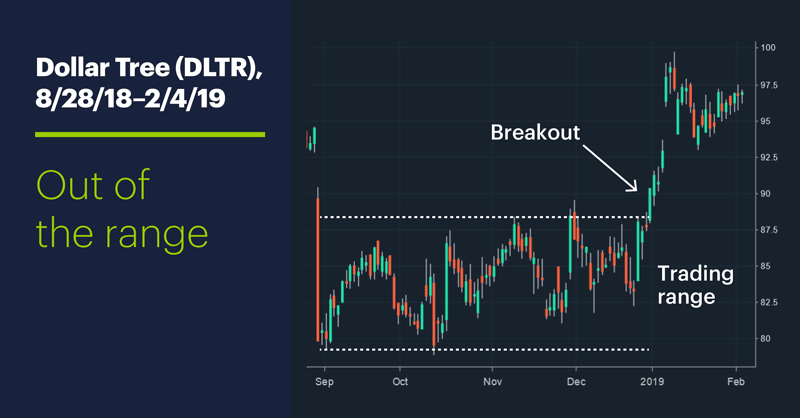 After breaking out of this range in January 2019 around roughly $88, the stock quickly shot up to around $100 before pulling back and rebounding. Those traders eyeing potential upside (or limited downside) in DLTR may see opportunity in put options that are possibly trading at relatively rich prices because of higher IV. 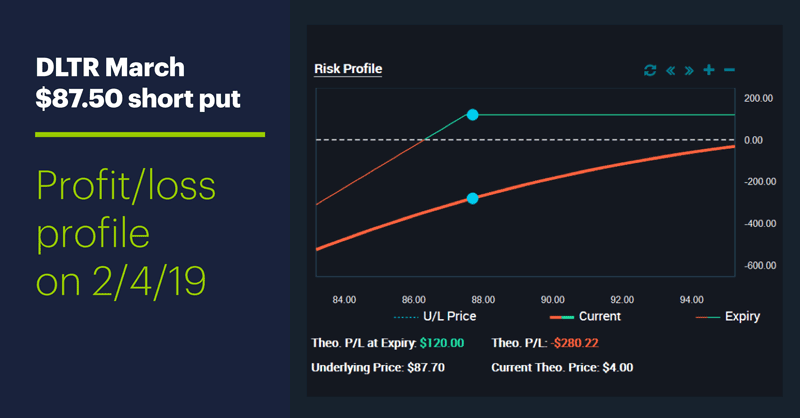 For example, such traders may short out-of-the-money put options, such as the March $87.5 puts (which expire on March 15), in the expectation of continued DLTR gains, or at least a pullback that doesn’t fall below $87.50 for too long. (This level would, for example, anticipate the possibility of a return to the trading range breakout level.) More bullish/aggressive traders may choose a strike price closer to the current stock price. One caveat: Dollar Tree is currently scheduled to release earnings on March 7 (before the March options expire), an event that will likely be preceded by an IV increase, and possibly accompanied by a big move in the stock. But IV is also likely to decrease dramatically immediately after earnings. Some traders may choose to avoid this uncertainty by selling options that expire before this date, but the trade-off is that they’d collect less premium. Finally, because puts tend to lose value during stock rallies and gain it during sell-offs, some traders may also look for a down day to sell their options. Experienced traders know they need to combine appropriate tactics with any given trading strategy, to maximize its potential. Market Mover Update: Yesterday Dropbox (DBX) climbed nearly 2% intraday, while Starbucks (SBUX) shed more than 1%, following through on Friday’s intraday downturn. Today’s numbers (all times ET): PMI Services Index (9:45 a.m.), ISM Non-Manufacturing Index (10 a.m.). And don’t forget: The State of the Union address is tonight. Today’s earnings include: Aramark (ARMK), Archer-Daniels (ADM), Array Biopharma (ARRY), BP (BP), Emerson (EMR), Viacom (VIAB), Allstate (ALL), Electronic Arts (EA), Microchip (MCHP), Spirit Airlines (SAVE), Suncor Energy (SU), Tableau Software (DATA), Walt Disney (DIS), Zendesk (ZEN). 1 Reuters. Activist Starboard seeks Dollar Tree board changes, disposal. 1/7/19. 2 Barron’s. Fund Manager: Dollar Tree Can Gain More Than 50%. 1/24/19.